If anyone is dependent on any third-party plugins, and wishes to see them supported in 64-bit, please PM me a link to their thread or github. Location: In a dead-end shithole. Yep, the 64b version crashes upon startup. Maybe the 3D floor plugin? For me the x64 version crashes upon closing an editing session. StrikerMan780 wrote: If anyone is dependent on any third-party plugins, and wishes to see them supported in 64-bit, please PM me a link to their thread or github. Looking at the crash log, are any of the default plugins compatible? One of the issues (stack trace with OnMapCloseEnd, issue #199) was resolved by making plugins build in non-optimized mode (Builder.exe, where the renderer and ZScript parser is, is still optimized). It might have also fixed the other crash-on-startup issues, but needs testing by other people. 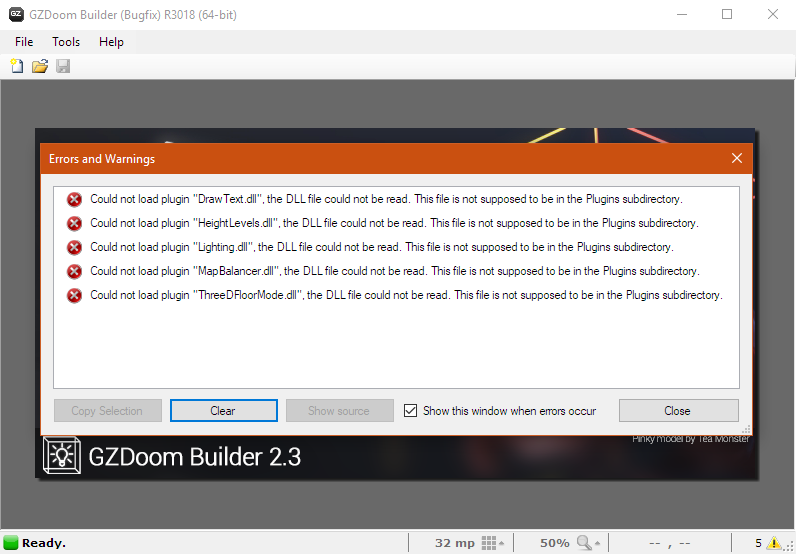 Apparently the root of the issue is the updated DevIL.dll, as it also seems to cause issues with PNG loading (IL_INVALID_HEADER) and crash the 3D mode (https://pastebin.com/vkYFjMuq). Crashes on startup should be fixed now (as of R3018). Thanks to various people (notably StrikerMan780 and leodoom85) for research and most importantly testing. The random DevIL-related crash was not fixed yet, but I'll probably remove DevIL some time later. What I did before to get this crash? 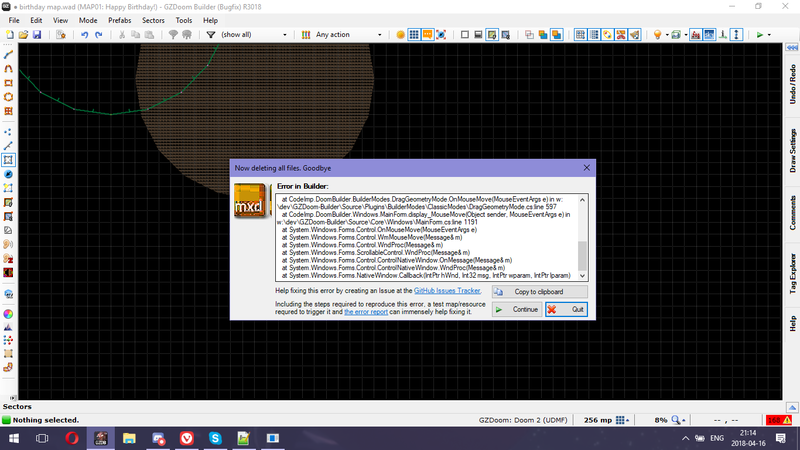 I just drew round sector with "draw ellipse mode"(it was somewhere 3120 in all sides) in gzdoom udmf, moved it and seek for comfortable position and sector started act weird-instead of moving sector, it started to move round linedefs, leaving what's inside and builder got crazy and crashed like this. Linedefs were closed. I'll leave image in spoilers to save space. 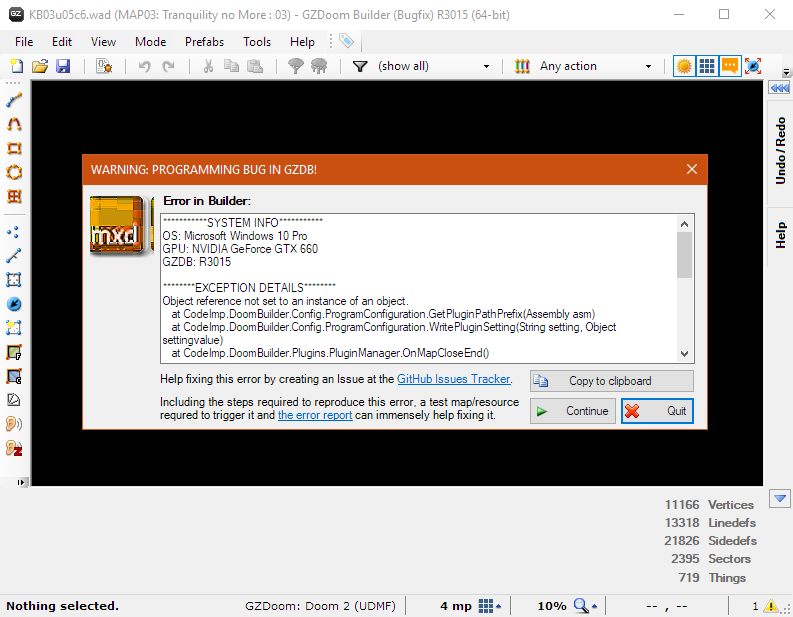 I don't know if this error is easy to replicate, I use 64-bit version of gzdoom builder. Last edited by Blue Shadow on Mon Apr 16, 2018 8:00 pm, edited 1 time in total. Reason: Used [imgur] tag on screenshot(s). I've more or less found a method for applying D64-like colored lighting to 3D sectors. Create two overlapping 3D sectors in the parent sector. Lower one of the 3D sectors to floor level and raise the other one into the air to which ever height is preferred. Apply D64 colored lighting to the dummy sector (used for 3D sectors) so that the colors show below it and the parent sector so that it will show the colors above the 3D sector. Also be sure to check the "Restrict Lights Inside" flag for the 3D sector. As this is essential for this trick. And that should do it. If there are future plans to make D64 colored lighting compatible for 3D sectors (and ACS scripting, which would be awesome). I'd suggest going ahead and doing so. EDIT: Uploaded it anyway to get a gist of what I mean. It looks really cool ingame. Do not check the "Restrict Lights Inside" flag. This was a test from an earlier attempt. If this flag is check then you won't be able to apply light shading to the 3D sectors. Last edited by Mav3r1ck on Sat Apr 21, 2018 2:06 am, edited 1 time in total. 1. If you select 2 different actors which both share the exact same DECORATE Argument Keys, the arguments name will not be shown and treated as if they the keys are different. Could just be adjusted if they are completely the same? 2. Would it be possible to implement "Inheritance" for the Thing Type search? Could be made as an option that could be ticked when searching. (e.g. if I look for Thing Type 1 with the Inheritance box checked, it will also look for 2 and 3 if they inheritated from 1). Would you be able to make the Drawtext plugin compatible with x64, please. Does this support a feature that allows you to transfer colored lighting from a dummy sector to a parent sector? Mav3r1ck wrote: Does this support a feature that allows you to transfer colored lighting from a dummy sector to a parent sector? Yes. I know you can do that in UDMF format, and I think you can in Doom-in-Hexen, too. I looked at the zdoom Wikia but I couldn't find what I was looking for. Would you be able to tell me? Such a feature does not exist. 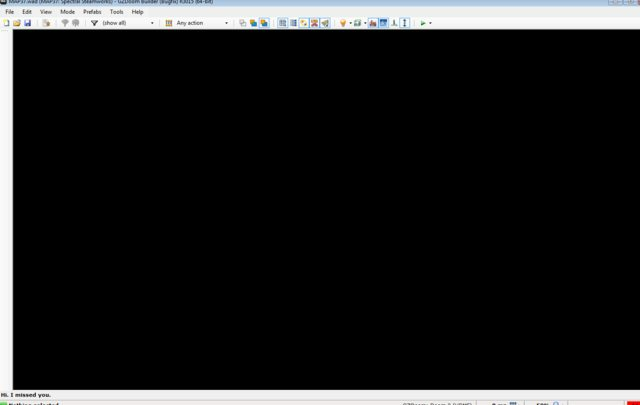 You can set a color directly but there is no transfer function. Why do you need one?